A buried pipeline marker for Enbridge Line 9. The Indiana Department of Environmental Management said a new pipeline that would ferry tar sands oil across Northwest Indiana poses no significant risk to water quality in the region. But local environmental groups see cause for concern in lax state and federal regulations, wary of energy company Enbridge’s checkered past. In 2010 Enbridge’s Line 6B pipeline ruptured near Marshall, Mich., spilling more than one million gallons of crude oil into the Kalamazoo River. Years later the cleanup drags on. With a price tag of $810 million, it is the most expensive oil pipeline spill in U.S. history. Line 6B begins in Griffith, Ind., less than 10 miles from the Illinois border. The pipeline crosses three river systems in its 60-mile journey across Indiana, all within 20 miles of Lake Michigan through Lake, Porter, LaPorte, and St. Joseph counties. It took several hours to respond to the 2010 spill, and the National Transportation Safety Board ultimately admonished the company for "a complete breakdown of safety." Michigan regulators in February approved the construction of a new 160-mile segment of that line, and Indiana’s approval of upgrades to their section of the 43-year-old line was expected, due to its role as a major supplier to Upper Midwest oil refineries. But nonprofit group Save the Dunes called the recently issued water quality permit "a mixed bag for the environment." Save the Dunes has not tried to prevent the pipeline replacement, but last year urged Indiana’s Department of Environmental Management "to ensure that Enbridge implements every possible precaution to protect the people and natural resources of Northwest Indiana and Lake Michigan." The upgrades include an expansion of certain sections of the pipeline, which would increase the amount of oil traveling near Lake Michigan. But because it is a replacement and not an entirely new line, the project is not obligated to meet any additional safety standards. Nonetheless, in their permit, IDEM ensured Enbridge will hire independent environmental monitors to oversee construction — the first time it has included such a provision in a construction project and “a positive precedent,” according to Nathan Pavlovic, land and advocacy specialist for Save the Dunes. But that provision does not extend to the entire project. Enbridge has committed to treating the whole 6B as a “high consequence area” due to its proximity to the lake, requiring greater internal scrutiny, and it established an online training course for emergency responders. Among the safety increases Save the Dunes wanted but did not get are guarantees that Enbridge will use state-of-the-art concrete caps and domestically produced steel, as well as leak detectors that would warn when as little as three gallons of oil are spilled. But more broadly speaking, environmental groups said the law should push pipeline companies to more carefully consider alternate routes when a route would skirt a major source of drinking water like Lake Michigan. 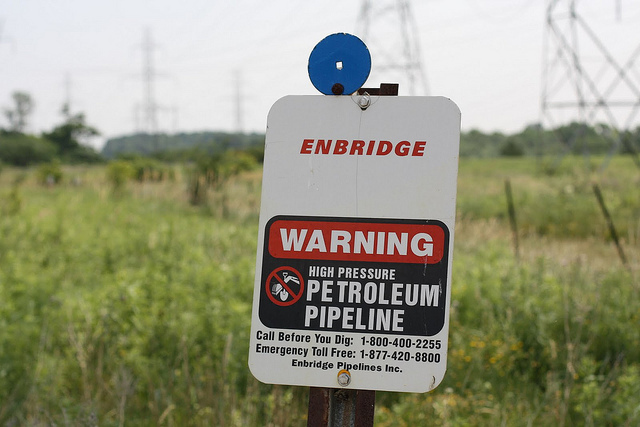 “IDEM, through its certification, is allowing Enbridge to disregard alternate pipeline routes and other opportunities to reduce and eliminate water quality impacts, in likely violation of the Clean Water Act,” said Kim Ferraro, staff attorney at the Hoosier Environmental Council. Both Michigan and Illinois have laws governing interstate pipeline routing, requiring companies to assess environmental and community risks, but currently Indiana does not. The pipeline still needs the approval of the Army Corps of Engineers. Save the Dunes and the Hoosier Environmental Council will focus efforts there, and in LaPorte County, where the Joint Zoning Ordinance sets strong standards for water resource protection on all new development. They are also petitioning federal agencies for stricter standards. Enbridge moves more oil from Canada into the U.S. than any other company, with more than 15,000 miles of pipeline transporting crude oil. For many North American environmental groups the company has become a target for climate change action. The Indiana and Michigan projects are part of $2.2 billion plan to upgrade Enbridge’s Lakehead system of pipelines that encircle Lake Michigan, which climate activists worry will just hasten the impacts of global warming by facilitating the continued combustion of fossil fuels.